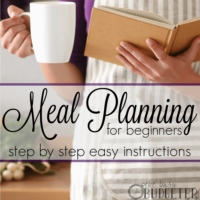 If you struggle with planning meals, check out this step-by-step process for simple meal planning. Do you want to save more on your grocery bill? Is dinnertime always a huge hassle because you never quite know what to do or what to make? Do you dread grocery shopping because the bill is always higher than you expect? Okay, if that sounds like you, it’s time to try menu planning! I’ve been doing this for a while and I’ve heard from a LOT of readers who also really love it and say that it works super well for their families. No matter what your grocery budget or culinary skills, meal planning helps you get in and out of the kitchen quickly and prepare meals your family will eat and enjoy (and that won’t freak you out in the checkout line when you see the receipt). Here’s the deal. I’m not a fan of those MAJOR meal planning endeavors that require a workflow, coupon expertise, and an abundance of time and effort. Just, no. I mean, really, if you don’t have time to be in the kitchen, how can you be expected to have two hours to make a plan to keep you out of the kitchen? This method is simple and it works really well. It’s easy and so customizable! Your grocery bill is the biggest line item you can flex in your budget, but it’s a balance. If you cut it too much, you’ll end up going out to eat too often because you don’t have anything in your kitchen to fix. If you end up going over budget, you’ll have food that goes bad or ingredients that are one-trick ponies. Take a look at your family and your lifestyle. If you and your spouse are on different shifts, if you go out all the time with friends, or if you have very young kiddos who are adjusting your sleep and food schedule for you, meal planning might be a challenge, but don’t give up! You can do this! What are your favorite foods? What are your favorite meals? What do you really not enjoy (like leftovers or sandwiches)? Do you know how to cook? Do you like to cook? What do you like to cook? Once you’ve sketched out your needs and your lifestyle, you’ll have a more realistic picture of what “cooking at home” looks like for you. If you hate cooking or just don’t know how, you might want to lean on some of our easy 15 minute meals. If you’re a beginner to the meal-planning scene, don’t try to go full throttle and plan to eat a full, fancy three-course dinner at home every night. You’ll just get frustrated and feel bad. Keep it realistic and aim for a few days a week to start. 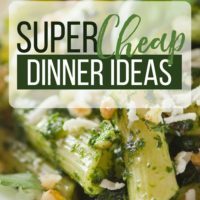 If right now dinner is frozen pizza or boxed mac and cheese every night, and you’d like to add a few new dishes to your menu, try picking one or two nights a week to try new things. Don’t overwhelm yourself or cooking will become a miserable chore. Reader Andrea says, “Once I did my assessment I had a pretty clear picture of where we were with food. I have a toddler so I was typically snacking and finishing her food and making easy things for her like SpaghettiOs and finger foods. 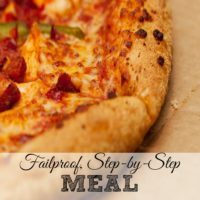 When my husband got home at 8, starving, I wasn’t that hungry because I had picked off my daughter’s plate, but I wanted to eat with him, so we could put the baby to bed and sit down together. Either I’d text him to bring home some fast food or Chinese, or we’d order pizza and I’d eat all of it too. We only go out on Friday nights, but we were still spending too much on dinners, and there were never leftovers for him to take to work, so he usually picked up something from a restaurant for lunch. I did my assessment and I set a goal to make meals three nights a week that would stretch over to the next day. I used some of your rotisserie chicken recipes (which are here) and ground beef we got on sale, and then used it in a couple different dishes. I tried to think of foods that I could feed my daughter, like ham, peas and pasta, and then use as a side dish with our dinner together. Look at your calendar, your spouse’s calendar and anyone else’s calendar in your house. If you use Google Calendar or a planner, you can see what nights you have meetings, or family or kid activities. If there’s school stuff, lessons or other things going on, you can anticipate them ahead of time and plan ahead. For example, late nights might mean you’re not feeling like cooking, so that’s a great night to have a slow cooker meal ready from your freezer or prep something super simple like 15 Minute Sloppy Joes. If you’re going to have leftovers from Sunday (when you have time to make dinner) and Friday is a long day, you might want to use the leftovers to prep some Easy Make Your Own TV Dinners. The idea is to simply anticipate what will fit into YOUR week and what roadblocks you might run into. Even if a few nights a week you still opt for going out, by looking at your calendar, you can plan ahead to pick up something on your way home that’s a little cheaper or that you like better (rather than running out and hitting the nearest joint). Reader Danielle reports, “Google Calendar doesn’t really work for me, but we have a family calendar on the wall where we track appointments, soccer games for my sons, and any after-school stuff. I know my husband’s work schedule already. Ask your family to join you in your endeavor to eat at home more often and start meal planning. This gives them a chance to veto and voice anything they want to weigh in on when it comes to meals. It also gets everyone on the same page so you can remind each other to stay on track. Sometimes when you or your spouse has a long day (you know how it is), you’ll both look at each other and be like, “We’re going out for dinner”…or maybe friends invite you out or something comes up. Give yourself permission to stay flexible as you work on eating out less often and eating at home more, especially if this is a new step for you. So there are two ways to go about the actual meal planning. Doing it on paper takes longer, but some people prefer paper planning and like the meal planning template. Basically, you’ll end up with a binder with a paper planner, recipes and references and use it to create your grocery list and budget. I use an app called MealBoard for iPhone, which is an A-MAZ-ING, super easy app to get you started on meal planning—it pretty much does all the hard work for you. You still have to do a little thinking, of course, but it’s really easy and there’s a step-by-step process to enter the information in as you go. Once you’ve used the app or created your paper plan, you’re ready to implement your new menu planning. 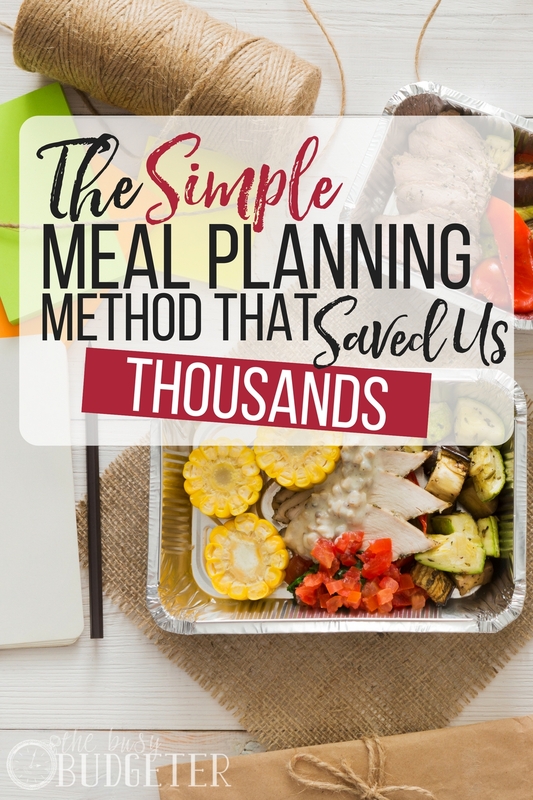 I know meal planning can sound like a lot of coordination and thinking ahead, but once you start, you can save tons of money. (I’m talkin’ thousands of dollars a year!) In fact, I think once you look at what you spend on going out to eat and fast food, you’ll be surprised at how you can meal plan ahead and still find room to enjoy your favorite restaurants and meals! Please let me know what you think of meal planning and what results you’ve seen! Great tips! I’ll have to keep them in mind for when I plan my weekly grocery trips. Well I am a father but I can understand that how moms have to plan daily meals to maintain proper nutrition of the food. Apart from this fact, here I can find really useful tips that can help moms to save money on groceries. It should be really useful for moms. 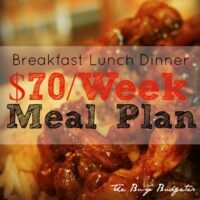 I love your tip about making sure your meal plan is realistic for YOU. I am good about planning, but I get overzealous and think I’m going to cook every night, but after a long day I opt for going out or eating leftovers. Planning leftovers into my menu means that there is less wasted food–but meal plans are always a work in progress! I love to cook meals then freeze them for dinner he says I just don’t feel like cooking.